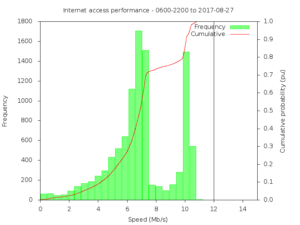 We have had wired broadband service delivered to these premises for almost ten years, supplied by three vendors: Telstra Bigpond, iiNet, and Amaysim. 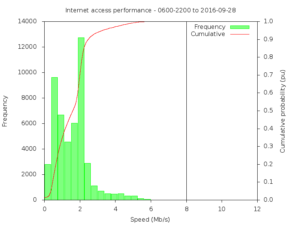 Amaysim has supplied a 25Mb/s broadband service for a month now and set an important baseline for service. 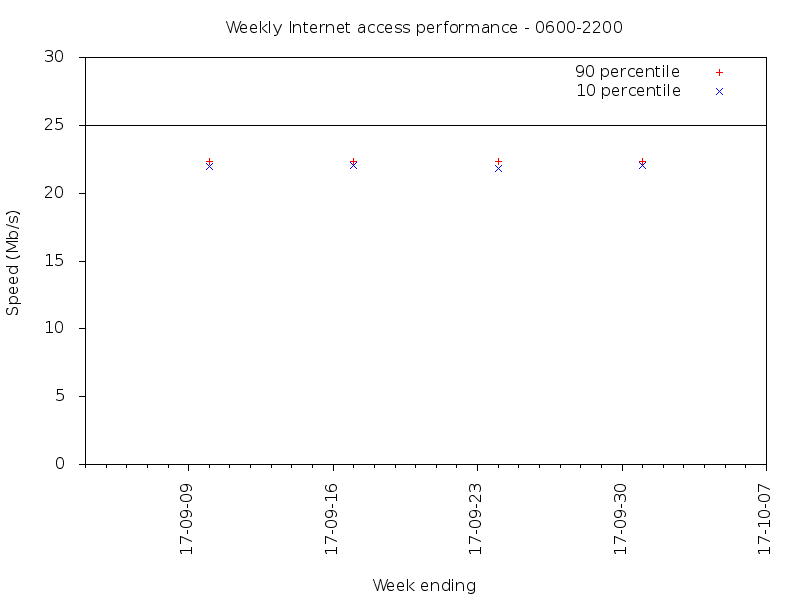 Above is a plot of the 90 percentile and 10 percentiles for each week so far. A way to interpret the percentile is that the 10 percentile is the speed that is delivered 90% of the time, and if you think it is fair that the supplier should deliver the ‘rated’ speed most of the time, 90% of the time, the 10 percentile is a key measure. A different view is the frequency histogram of test results. 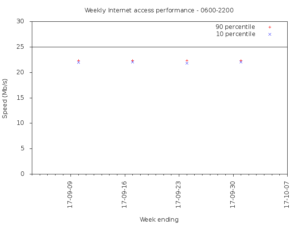 Above is the frequency histogram of the 12Mb/s iiNet service over 45 weeks (224 test downloads per week). 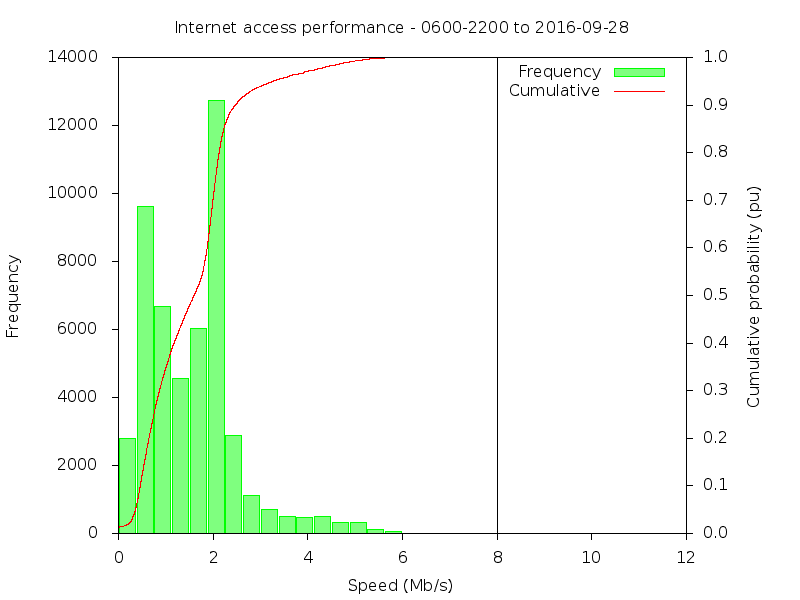 Sadly, iiNet delivered a lower portion of the 12Mb/s paid for, indeed speed did not exceed 4Mb/s ‘most of the time’. 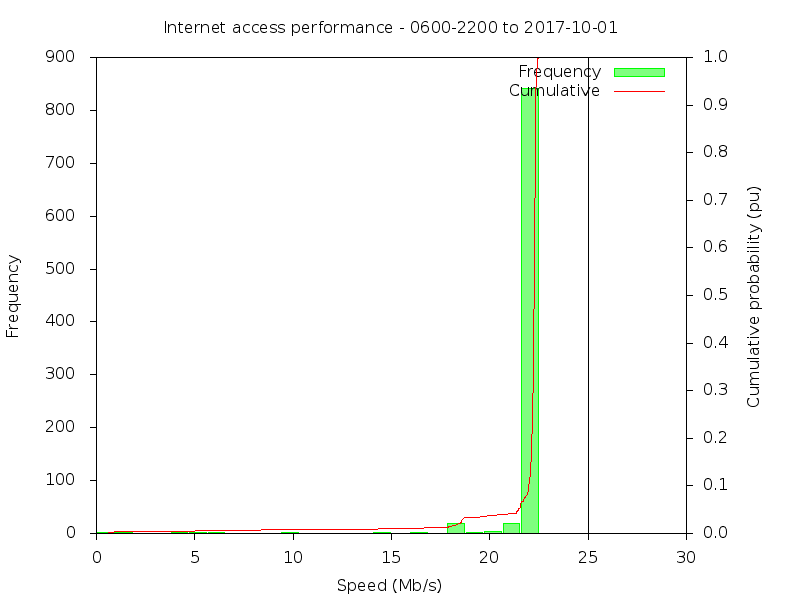 Above is the frequency histogram of the 8Mb/s Telstra Bigpond service over 224 weeks (224 test downloads per week, more than 50,000 in all), less than 2,000 exceeded half the subscription speed. 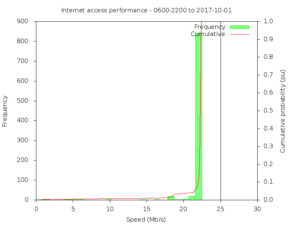 Even more sadly, Telstra delivered a lower portion of the 8Mb/s paid for, indeed speed did not exceed 0.5Mb/s ‘most of the time’.